Emtalks: A Huge Thank You; Ray-Ban Giveaway! Me wearing the Ray-Ban CATS! 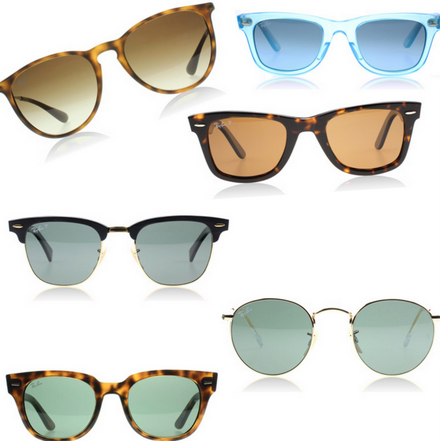 If you're wondering which Ray-Bans are next on my wishlist... look above for some inspiration. I can't believe it's August already, but that also means that it's Festival Season! The Sunglasses Shop are putting their Ray-Ban festival collection into the spotlight this month - is anyone going to any festivals? I wish I was so that I could wear some super bright and big Ray-Bans! Onto the prize: the prize is a pair of Ray-Ban sunglasses of your choice up to the value of £125. So how do you win? All you need to do is subscribe to my YouTube channel, like Sunglasses Shop's Facebook page, and comment on my post with which pair you'd like to win - head to the Sunglasses Shop here to have a look at the pair you like! There are lots of other ways that you can enter too, those are just the mandatory options - you can enter on the Rafflecopter below. Good luck everyone! Don't forget to comment and tell me which pair you'd like to win! Thanks for all your amazing support with my blog over the past two years! Wonderful giveaway! My sister's always wanted a pair so I'd definitely surprise her with some Wayfarers! Great giveaway, I've always wanted a quality pair of ray bans! I think the CATS 1000 tortoise shell will always be my favourites :) lovely giveaway Em, congrats on the pageviews! wow, lovely chance! :) thanks! Congrats on hitting such a great milestone! Ooooh gold aviators for me please!